Today’s recipe is super and relatively simple, though the result seems complex! 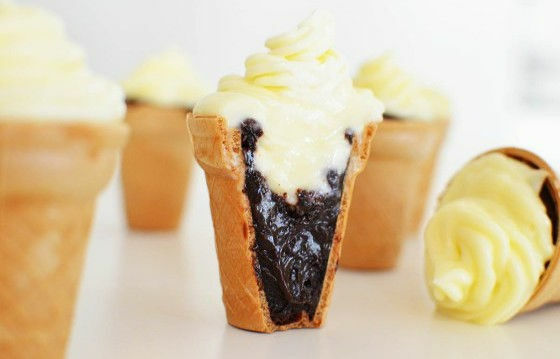 These are brownies that are baked in an ice cream cone and garnished with cream cheese! 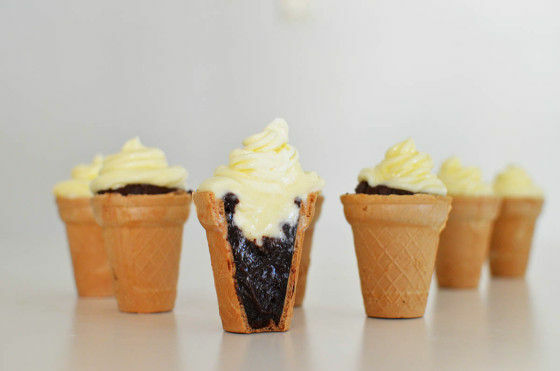 So simple… Looks like ice cream but it’s cupcake! We make two preparations: one for stuffing brownies and one for the cream! The recipe draws about 25 cones. Melt the butter and the chocolate, in a double boiler and mix until smooth. In a separate bowl, mix together the cocoa powder, flour, baking powder and sugar, then add this to the chocolate mixture. Stir together well. Beat the eggs and mix them in mixture, until you have a silky consistency. 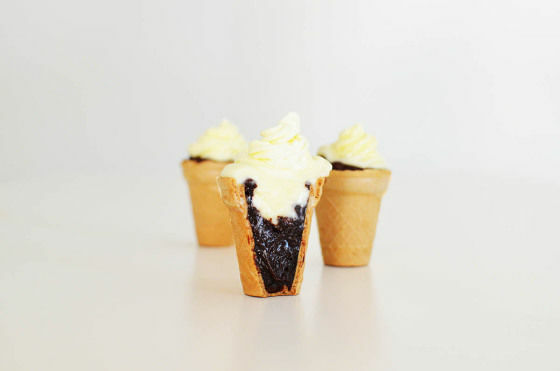 Pour your brownie mix into the cones, and place in the oven for around 15 minutes. You don’t want to overcook them so, unlike cakes, you don’t want a skewer to come out all clean. The brownies should be slightly springy on the outside but still gooey in the middle. Allow to cool in the tray, then carefully transfer to a large board. Put all three ingredients in a bowl and mix with a spatula until you have a homogeneous mixture. Transfer the mixture into a piping bag and leave in the fridge for at least one hour. Garnish cones as you do with cupcakes.